The model A-AI-1 or A-IAI-1 attachable indicator provides an ideal solution for a local readout with simultaneous 4-20 mA signal transmission.The universal programmability and simple mounting allows the display to retrofit existing installed transmitters equipped with a full size DIN plug. It is loop powered so no additional power supply is required.The scaling is adjusted by accessing three buttons under the front cover. The user is prompted through the programming steps by a logically arranged menu and prompts displayed on the LCD.Two user-selectable filtering levels smooth the display during dynamic pressure changes and brief pressure peaks can be suppressed. All programmed parameters are stored in an EEPROM so in the event of a power failure reprogramming is unnecessary. The IS attachable indicator model A-IAI is designed for use in potentially explosive atmospheres. This IS attachable indicator can be combined with an IS-transmitter and with an IS signal isolator or IS transmitter power supply to enable the use in Zone 1 hazardous areas.The display is provided with an integrated, continuous self-diagnostic circuit that monitors indicator function. 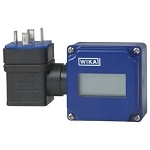 The integral self-diagnostic system provides error messages for sensor failure along with upper or lower deviation from the range help provide a high degree of safety.The sturdy and compact plastic case provides IP65 ingress protection, making the display ideally suited for a great variety of industrial applications.